The tool is delivered as a single executable. The installation steps are straight forwarded. There are options to specify the destination location and the name of the Start Menu folder. After the installation you can directly start the application and you need to register the application, so you will receive the license key via e-mail. Every time you start the application you need to acknowledge that you understand the power of the utility. A bit annoying that there is no option to disable this warning message. 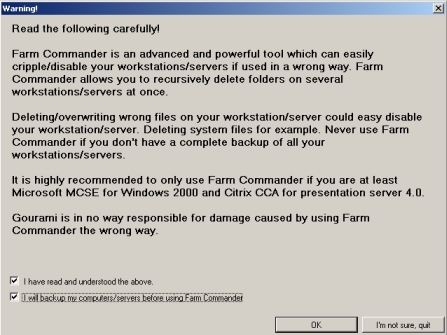 The interface of Farm Commander looks a lot like the famous Total Commander, in those times that we are still using DOS and there was no graphical interface to browse folder and files. 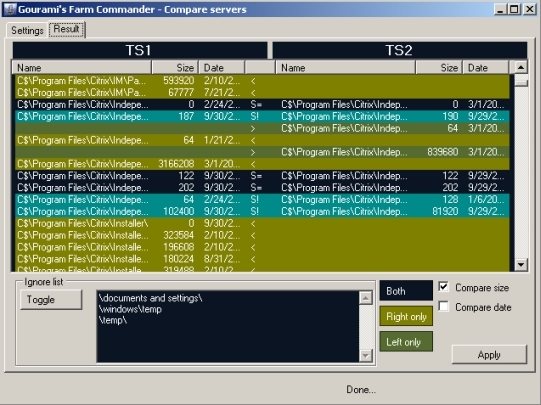 So it feels like a bit back to the old days, some people will like it and others (which never worked with Total Commander) will find it Spartan. Citrix Servers: the tool will query the farm (if you run the tool on a Citrix server with enough rights) and will show the available Citrix servers. Published Applications:the tool will show the available Published Applications. When choosing a Published Application the server hosting that application will be selected. Beside those shortcut keys there are also several options available in the upper menu - Remote Panel. Some examples are nslookup, show uptime, search evenlog and show/adjust services for the selected server(s). Three specific options in this menu I would like to mention separately because I love that options the most. This option is a real good one. As described in one of my first article Basic Principles of Terminal Servers is guarantee that the servers are 100% identical. To check if this is still the case you can compare two servers file system if there are any mismatches. You can specify which disks should be compared. After a while the results are shown, based on file size or file data. With specific colors the differences and matches are displayed. Beside for the daily administrations tasks this feature is also wonderful which carry out a (quick)scan on the customer's environment. In the same category as compare file and folder is the option compare installed software, which checks if the same applications are installed on two systems. Basically the registry is read out to determine which applications are installed (displayed within add/remove programs). However both features are just comparing two servers, so in big farms it's a heavy job to test all servers every day, but it can give a clue why one server is responding different than the other servers. I expected a bit more of this feature, mainly based on the title of the feature. I expected a possibility to build a reboot schedule, going further than the default Citrix reboot feature. But actually this is a Graphical User Interface to directly reboot servers. You can select one or more servers and reboot them with an interval. The usage of utilities already starts with the first steps. 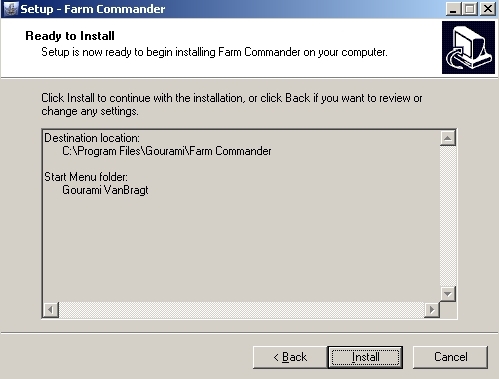 With farm commander you will two have kind of people, you will like it or hate it (because of the total commander look). Because of the GUI lots of commands can be carried out pretty easy. I really like the compare installed programs and files/folders options, however it would be nice if more servers could be compared with each other. The current implementation is mainly based on troubleshooting a specific server. 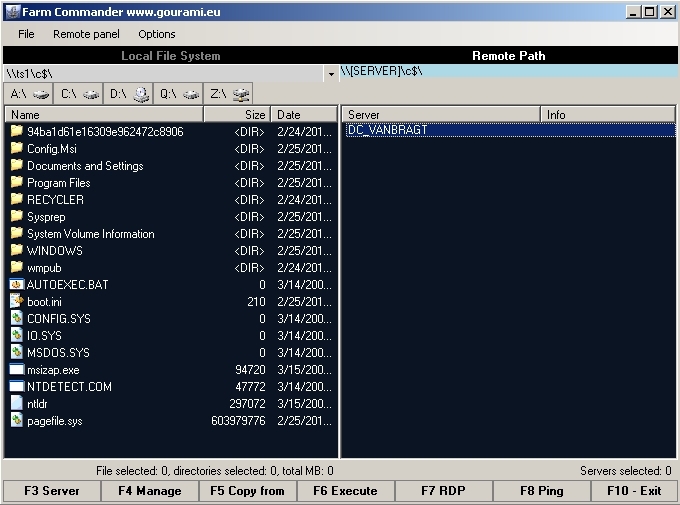 However the tool offers nice features, which can be used in several infrastructures.